More Than Just A Voucher... Gift a New Career! With our Gift Vouchers, your Recipient can redeem their Voucher against any Training Course, Package or Qualification. Valid until 30 September 2019 giving your Recipient plenty of time to choose & book their chosen course. 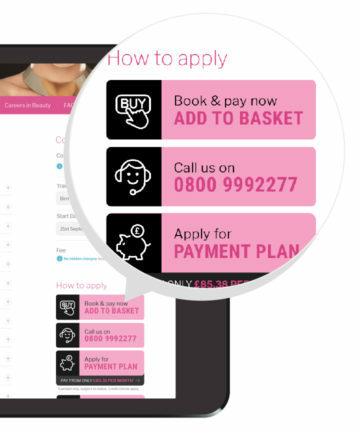 The Beauty Academy offer over 100 different beauty courses including Online Courses, 1 Day Intensive Training Courses, Internationally recognised VTCT qualifications, BABTAC & The Guild Accredited courses and Quick Start beauty training packages. Whether looking to start your own business working from home or mobile; or to gain employment within a Salon, Spa or even open your own Salon premises; we certainly have a course to meet your needs. All training is accredited by ABT allowing you to gain insurance, purchase professional products from wholesale suppliers and begin earning quickly! Our Gift Vouchers are the perfect solution for you or your loved one, allowing you to give the gift of a New Career in 2019. Redeemable towards any training course of the recipient’s choosing! The Beauty Academy Gift Voucher opens a whole world of opportunities for your beloved recipient! Whether they are looking to start their own business, change careers or just find a way to earn more alongside their current employment; we have a course option for everyone. Our Gift Vouchers can be redeemed against any training course, package or qualification offered by The Beauty Academy. Your recipient can complete their training at any of our 10 highly equipped, well located training centres across the UK. Choose a gift that lets them start a New Career with endless opportunities! Vouchers are available in a wide range of values to suit all budgets and requirements. Other denominations of voucher can be found here. Vouchers can be used as full or partial payment towards any training course of your recipients choosing. Once you have processed payment for the voucher, you will receive an email confirming your order with a link to download the gift voucher immediately. This can then be emailed on, or printed to present in person to your recipient. A printed copy of the voucher(s) can be requested to be posted out by emailing [email protected] – please note vouchers will take up to 7 working days to be received from date of the request. Your recipient can then redeem their voucher when ready to book a course by calling 0800 999 2277 and simply quoting the name of the person who purchased their voucher. Gift Vouchers can be redeemed by calling 0800 999 2277 and quoting the name of the original voucher purchaser. Gift voucher balances have no cash value and are non-refundable and non-transferable after purchase. Gift vouchers can be used in multiples if desired, towards chosen course payment. Any additional payment due (if applicable, dependent on course selected) would need to be paid at time of booking. No ‘change’ from gift vouchers will be given but applied as a credit on file towards further training.